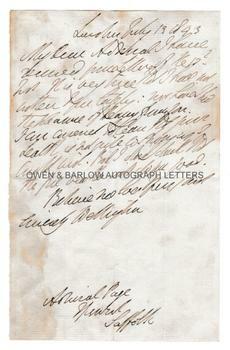 DUKE OF WELLINGTON Autograph Letter signed. Arthur Wellesley, 1st Duke of Wellington. British soldier, victor of Waterloo and twice Prime Minister of the United Kingdom (1824 and 1828-30). ALS. 1p. London. July 13th 1843. To Admiral [Benjamin] Page, Ipswich, Suffolk. "My Dear Admiral, I have received your letter of the 12th inst. It is very true that I have not written to you lately, nor have I had the pleasure of hearing from you. I am concerned to hear your health is not quite so . . . [?] as I could wish. But I do not doubt that the fine weather will do you good. Believe me [. . . ] Yours sincerely, Wellington." 8vo. Approx 7.5 x 4.5 inches (19 x 11.5 cms). 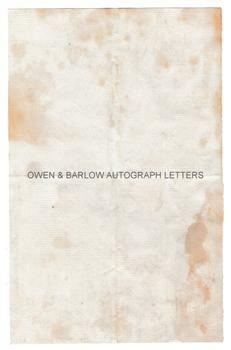 Old folds and creases, some browning and foxing and with mounting traces to verso. Lacking the blank leaf of the bifolium. In good condition. Admiral Page (1765-1845) was a contemporary of Nelson and Hood. He fought in the Napoleonic War and, as Commander, he served as Captain of HMS Daphne in 1797. He retired to Admiral's House in Ipswich, where the Duke of Wellington visited him on at least one occasion in 1820.